The Hilton Hurghada Plaza is a majestic five star hotel that overlooks the Red Sea in Egypt. The hotel has its own private beach and offers guests the experience of adventures in the desert or leisurely pursuits such as boating and snorkelling around nearby turquoise lagoons or the open sea. The property integrates high quality services and amenities with environmentally sustainable practices. Hilton Hurghada Plaza Hotel is the first Hilton Hotel in Europe, Middle East and Africa to earn Green Globe certification. This year it has again received Green Globe certification after fulfilling the stringent criteria. The hotel’s general manager, Mehdi Othmani, attributed this achievement to the hotel’s leadership team and its green team who were dedicated in undertaking designated roles covering all aspects of best practices in sustainability. 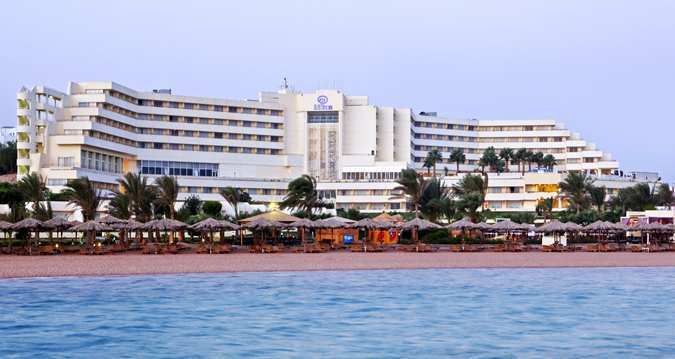 Othmani said: “We look at this award as recognition of the progressive and sustainable environmental operating policies that Hilton Hurghada Plaza has been pursuing for the past few years. Acknowledgement of Hilton Hurghada Plaza’s team efforts was further realised at the 2014 World Travel Awards in London last November when the property won not one but two awards for Africa’s Leading Green Hotel and also Egypt’s Leading Green Hotel. The Hilton Hurghada Plaza Hotel is committed to maintaining the highest level of sustainability and complies with local and international regulatory bodies. On-site wells and a generator licensed by the Egyptian Government are in place to reduce water and energy usage. Also, water and energy consumption and associated costs are continually monitored. Last year, water consumption was reduced by two per cent, which was achieved in part by the installation of water saving devices in guest rooms. Greenhouse emissions and waste output is also monitored daily by the hotel’s in-house sustainability management tool, Lightstay. A sewage treatment plant is in place and resulting water is used for irrigation. Any residual waste in the form of sludge is collected by a licensed contractor and disposed of at environmentally approved destinations. In addition, a dedicated garbage separation room has been built. To further reduce Hilton Hurghada Plaza’s impact on the environment a number of initiatives are in operation at the hotel including regular training for employees regarding sustainability policies and procedures. As for the hotel’s purchasing policy, most suppliers are environmentally certified and only eco-friendly chemicals are used. As part of its social responsibility to engage with the surrounding community the hotel has been involved with several programs involving youth including spelling bees to improve literacy levels and local doctors providing medical assistance to disadvantaged orphans and children.